Due to its massive popularity, Tweeting is now a term that is commonly spouted by many children and adults around the world. It’s easy to see why social media is so important in this day and age, especially for marketing. The simple, yet alluring appeal of going on your Twitter account to comment about the latest happenings in the world, amusing anecdotes, or even advertise your business in 140 characters or less is nothing short of phenomenal. 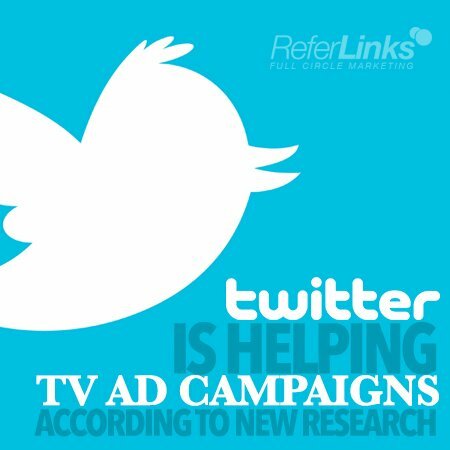 In fact, new research shows that Twitter is having an impact on TV ad campaigns. In the first consolidated results from its Social TV Lab, Twitter and Starcom MediaVest Group unveiled some intriguing information regarding the popular social network’s effect on TV ad campaigns. The Twitter / TV Multitasker is Here – and TV Ad Recall is High for them. Only one quarter of tweeting occurs during the ad break, and it was highest during reality shows (27%). This supports existing Twitter research that found viewers who are actively engaging in social media while viewing TV are genuinely paying attention to both screens as TV show tune away is less and ad recall was higher for TV Twitter multitaskers. If you’d like to learn more about this study from Twitter and Starcom MediaVest Group, simply click here. This entry was posted in Social Media and tagged Online Marketing,Social Media,Social Media Marketing,Social Media Research,TV Ad Campaigns,TV Ads,Twitter on July 29, 2014 by ReferLinks Online Marketing.